Chicago child custody attorneys fighting for your child’s best interest. Illinois child custody laws can be very complex and confusing. Of all the areas of family law, child custody cases have a tendency to be the most volatile. When parents divorce and they disagree as to what is in the best interest of their children, the Illinois courts intervene. This can quickly turn a peaceful, uncontested divorce into a heated, no holds barred, battle for custody and an experienced Chicago child custody lawyer is invaluable asset to have on your side. As a parent, you always want to make sure that your children are safe, protected and well cared for. Having a top Chicago child custody lawyer can make a vast difference in the outcome of your custody case. 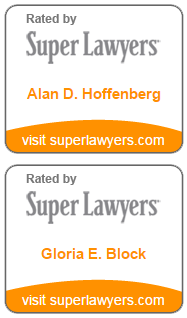 At Hoffenberg & Block, LLC, we assist our clients in fighting for their child’s best interest. Our Cook County child custody attorneys have the skill, knowledge and experience needed to help families quickly resolve these highly sensitive matters and ensure you achieve the best possible outcome. Child custody refers to the care, control, maintenance and legal guardianship of a child which a court may award to one of the parents following a Divorce or separation proceeding. In Illinois, and most other states, there are two forms of custody, legal and physical. Legal custody refers to the child’s lifestyle. Religious, medical, and educational decisions are made by the legal guardian. Legal custody can be granted to one or both parents. Physical custody refers to where the child resides. One parent may have sole physical custody, and the other may have visitation rights. Or, both parents may have physical custody, which means the child lives with each parent half of the time. If a parent has visitation rights, the visits between parent and child occur on a schedule provided by the court. Usually this schedule is mutually agreed to and convenient for both parents. Our experienced team of Chicago child custody attorneys knows how difficult child custody cases can be. We also understand that the best possible solution is usually a decision that is mutually agreed upon by both parents as well as the child. By providing you with guidance and the best legal advice, your lawyer will explain the process and guide you through to a favorable outcome. For more information on representation and fighting for your rights as a parent, contact a child custody lawyer from our firm today.